Before the sun sets and Las Vegas' nightlife scene really picks up, there is a whole different element in place. Sin City's daylife is an up and coming party scene that is a close rival to the city's popular nightlife, and its venues like Mandalay Bay's much talked about pool club, Daylight, that help to give the day its life. 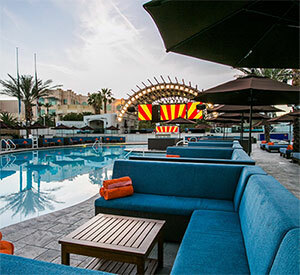 Created by The Light Group, known for its work up and down the Strip, the beach club combines everything you could ever want from a resort pool with the intricacies and high energy of a Las Vegas nightclub. This is the newest go-to spot for Sin City's partygoers, and with plenty of reason. One would think the desert sun would be far too brutal to party under, but Las Vegas' partygoers have shown little to no regard for the heat. Whether you're looking to take a dip in the refreshing resort pool or to find yourself lost in the onslaught of hip hop, top 40, and house music, this pool party should be on your partying radar. Daylight Las Vegas is one of the more impressive outdoor party spaces, with the ability to hold upwards of 5,000 people. The massive space is accented in a Mediterranean style with Mexican accents, all set in place to match Mandalay Bay's known opulence. You're not there for the décor, though, so chances are the first thing you're going to take notice to is the massive stage at one end of the venue. Decorated in thousands of lights, this structure will act as the focal point for the party. Here, it's line-up of entertainment, which include resident DJs Skrillex, Axwell, Alesso, and Baauer, will keep the party pumping by any means necessary. Accented by six large LED screens, this dayclub's entertainment will be a treat for both the eyes and the ears. There are plenty of places to escape the heat, so it may seem odd when you hear that an pool party like Daylight is on of them. Though the summer sun may be shining, there are several spots that you can use to escape it. While the pool may be the most obvious of choices, this venue offers far more in its impressive array of amenities. Included in the 4,400-square foot party space are various daybeds, all lining the pool. Lay back and soak in the sun's rays before rolling off and taking a quick dip in the refreshing, crisp blue waters. If that's not enough for you to escape the heat, then you want to look into reserving one of it's 23 cabanas. These partially enclosed structures line the outskirts of the club and give its inhabitants a semi-private space to tuck themselves away into. Equipped with air conditioning and comfortable seating, these cabanas offer the utmost in comfort, surpassed only by the venue's two bungalow suites. Though pricey on the surface, what you get for your money with these bungalow suites is well worth the cost. You and your party can escape to these enclosed structures for a completely private affair. Included in the high end offerings, these bungalow suites also offer a private bathroom, pool, and completely courteous wait staff. The crew behind Daylight Beach Club knows that one part of energizing the crowd is keeping them well fed and very well hydrated. A menu of varying cuisines is available to all attendees, which gives everyone the chance to reenergize as they day wears on. Indulge in summer fair that include sushi rolls, cucumber rolls, and tuna sashimi. Chase down your small meal with a selection from it's extensive drink menu, and you have yourself an all-around culinary experience right in the heart of a pool party. Spots at Mandalay Bay beach party fill up really quick, especially when it comes to cabanas and the two bungalow suites, so don't hesitate. Get on the phone today and guarantee yourself a spot in Las Vegas' high energy dayclub, Daylight. 5.0 on Feb 20, review by Sophia N.
5.0 on Jan 18, review by Tanweer A.